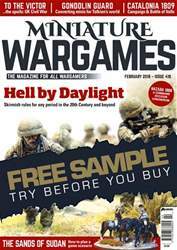 Get your FREE Sample issue of Miniature Wargames today! 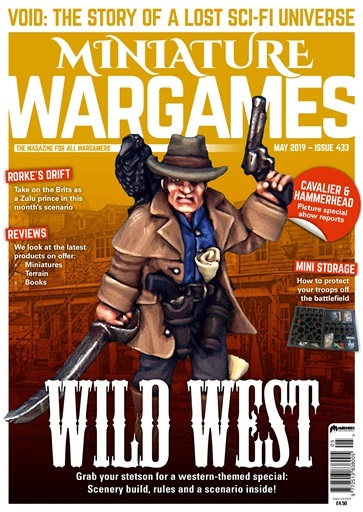 (1 Customer Reviews) | Write Review 12 issues per year Miniature Wargames looks at all forms of miniature wargaming, including historical, fantasy, Sci-Fi, pulp, steam punk and roleplaying. •	Rorke’s Drift: You are the half-brother of the Zulu King in Natal Province in January 1879. By Jon Sutherland. •	Gaze into the Void: A history of a lost future by James Winspear. •	Gender Balanced Armies: Bad Squiddo founder, Annie Norman, on female representation in wargaming. •	Pulling The Strings: An interview with miniatures masters, Puppetswar. •	Trips to the Hammerhead and Cavalier shows. •	All the usual news and reviews. Miniature Wargames looks at all forms of miniature wargaming, including historical, fantasy, Sci-Fi, pulp, steam punk and roleplaying. You'll receive 12 issues during a 1 year Miniature Wargames magazine subscription. 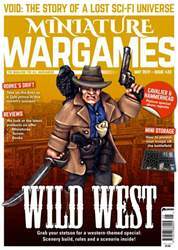 Loved This Mag - subscribed to the print version for many years, the digital version still as good, excellent for all Minature Wargamers. Wide variety of topics covered for the Minature Wargamer. You'll receive 12 issues during a 1 year Miniature Wargames magazine print subscription.